Sustainable mobility is a major challenge facing the Community in the light of climate change and the need to support European competitiveness, as emphasised in the Commission Communication of 8 July 2008 entitled ‘Greening Transport’. The Commission Communication of 19 October 2006 entitled ‘Action Plan for Energy Efficiency – Realising the Potential’ highlighted the potential for reducing the total energy consumption by 20 % by 2020 by means of a list of targeted actions including the labelling of tyres. The Commission Communication of 7 February 2007 entitled ‘Results of the review of the Community strategy to reduce CO2 emissions from passenger cars and light-commercial vehicles’ highlighted the potential for reducing CO2 emissions by means of complementary measures for car components with the highest impact on fuel consumption, such as tyres. Tyres, mainly because of their rolling resistance, account for 20 % to 30 % of the fuel consumption of vehicles. A reduction of the rolling resistance of tyres may therefore contribute significantly to the energy efficiency of road transport and thus to the reduction of emissions. Tyres are characterised by a number of parameters which are interrelated. Improving one parameter such as rolling resistance may have an adverse impact on other parameters such as wet grip, while improving wet grip may have an adverse impact on external rolling noise. Tyre manufacturers should be encouraged to optimise all parameters beyond the standards already achieved. Fuel-efficient tyres are cost-effective since fuel savings more than compensate for the increased purchase price of tyres stemming from higher production costs. Regulation (EC) No 661/2009 of the European Parliament and of the Council of 13 July 2009 concerning type-approval requirements for the general safety of motor vehicles, their trailers and systems, components and separate technical units intended therefor (3) sets out minimum requirements for the rolling resistance of tyres. Technological developments make it possible to significantly decrease energy losses due to tyre rolling resistance beyond those minimum requirements. To reduce the environmental impact of road transport, it is therefore appropriate to lay down provisions to encourage end-users to purchase more fuel-efficient tyres by providing harmonised information on that parameter. Traffic noise is a significant nuisance and has a harmful effect on health. 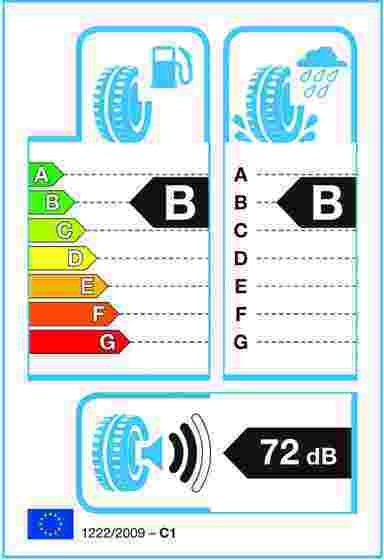 Regulation (EC) No 661/2009 sets out minimum requirements for the external rolling noise of tyres. Technological developments make it possible to significantly reduce external rolling noise beyond those minimum requirements. To reduce traffic noise, it is therefore appropriate to lay down provisions to encourage end-users to purchase tyres with low external rolling noise by providing harmonised information on that parameter. The provision of harmonised information on external rolling noise would also facilitate the implementation of measures against traffic noise and contribute to increased awareness of the effect of tyres on traffic noise within the framework of Directive 2002/49/EC of the European Parliament and of the Council of 25 June 2002 relating to the assessment and management of environmental noise (4). Regulation (EC) No 661/2009 sets out minimum requirements for the wet grip performance of tyres. Technological developments make it possible to significantly improve wet grip beyond those minimum requirements, and thus to reduce wet braking distances. To improve road safety, it is therefore appropriate to lay down provisions to encourage end-users to purchase tyres with high wet grip performance by providing harmonised information about that parameter. The provision of information on wet grip may not reflect the primary performance of tyres specifically designed for snow and ice conditions. Taking into account the fact that harmonised testing methods are not yet available in respect of such tyres, it is appropriate to provide for the possibility of adapting their grip grading at a later stage. The provision of information on tyre parameters in the form of a standard label is likely to influence purchasing decisions by end-users in favour of safer, quieter and more fuel-efficient tyres. This, in turn, is likely to encourage tyre manufacturers to optimise those tyre parameters, which would pave the way for more sustainable consumption and production. A multiplicity of rules concerning the labelling of tyres across Member States would create barriers to intra-Community trade and increase the administrative burden and testing costs for tyre manufacturers. Replacement tyres account for 78 % of the tyre market. It is therefore appropriate to inform the end-user about the parameters of replacement tyres as well as tyres fitted on new vehicles. The need for greater information on tyre fuel efficiency and other parameters is relevant for consumers, as well as fleet managers and transport undertakings, which cannot easily compare the parameters of different tyre brands in the absence of a labelling and harmonised testing regime. It is therefore appropriate to include C1, C2 and C3 tyres within the scope of this Regulation. The energy label which ranks products on a scale from ‘A’ to ‘G’, as applied to household appliances pursuant to Council Directive 92/75/EEC of 22 September 1992 on the indication by labelling and standard product information of the consumption of energy and other resources by household appliances (5), is well known by consumers and has proven to be successful in promoting more efficient appliances. The same design should be used for the labelling of tyre fuel efficiency. The display of a label on tyres at the point of sale, as well as in technical promotional material, should ensure that distributors as well as potential end-users receive harmonised information on tyre fuel efficiency, wet grip performance and external rolling noise at the time and place of the purchasing decision. Some end-users choose tyres before arriving at the point of sale, or purchase tyres by mail order. To ensure that those end-users can also make an informed choice on the basis of harmonised information on tyre fuel efficiency, wet grip performance and external rolling noise, labels should be displayed in all technical promotional material, including where such material is made available on the Internet. Technical promotional material does not include advertisements in billboards, newspapers, magazines, radio broadcasting, television and similar online formats. Potential end-users should be provided with information explaining each component of the label and its relevance. This information should be provided in technical promotional material, for instance on suppliers’ websites. Information should be provided in accordance with harmonised testing methods that should be reliable, accurate and reproducible, in order to enable end-users to compare different tyres and so as to limit testing costs for manufacturers. In order to reduce greenhouse gas emissions and increase the safety of road transport, Member States may put in place incentives in favour of fuel-efficient, safer and low noise tyres. It is appropriate that minimum fuel efficiency and wet grip classes be determined below which such incentives may not be granted in order to avoid fragmentation of the internal market. Such incentives may constitute State aid. This Regulation should be without prejudice to the outcome of any future State aid procedure which may be undertaken in accordance with Articles 87 and 88 of the Treaty with respect to such incentives and should not cover taxation and fiscal matters. Compliance with the provisions on labelling by suppliers and distributors is essential in order to achieve the aims of those provisions and to ensure a level playing field within the Community. Member States should therefore monitor such compliance through market surveillance and regular ex-post controls, in particular in line with Regulation (EC) No 765/2008 of the European Parliament and of the Council of 9 July 2008 setting out the requirements for accreditation and market surveillance relating to the marketing of products (6). Member States should refrain, when implementing the relevant provisions of this Regulation, from implementing measures that impose unjustified, bureaucratic and unwieldy obligations on small and medium-sized enterprises. Tyre suppliers and distributors should be encouraged to comply with the provisions of this Regulation before 2012 to speed up the recognition of the label and the realisation of its benefits. In particular, the Commission should be empowered to introduce requirements with respect to wet grip grading of C2 and C3 tyres, to adapt the grip grading of tyres specifically designed for snow and ice conditions and to adapt the Annexes, including the testing methods and related allowances, to technical progress. Since those measures are of general scope and are designed to amend non-essential elements of this Regulation, inter alia, by supplementing it with new non-essential elements, they must be adopted in accordance with the regulatory procedure with scrutiny provided for in Article 5a of Decision 1999/468/EC. 1. The aim of this Regulation is to increase the safety, and the economic and environmental efficiency of road transport by promoting fuel-efficient and safe tyres with low noise levels. 2. This Regulation establishes a framework for the provision of harmonised information on tyre parameters through labelling, allowing end-users to make an informed choice when purchasing tyres. 1. This Regulation shall apply to C1, C2 and C3 tyres. tyres designed only to be fitted on vehicles intended exclusively for racing. ‘essential parameter’ means a tyre parameter such as rolling resistance, wet grip or external rolling noise that has a notable impact on the environment, road safety or health during use. for each batch of one or more identical tyres delivered, accompanied by a label in printed format indicating the fuel efficiency class as set out in Annex I, Part A, the external rolling noise class and measured value as set out in Annex I, Part C and, where applicable, the wet grip class as set out in Annex I, Part B. 2. The format of the sticker and the label referred to in paragraph 1 shall be as prescribed in Annex II. 3. Suppliers shall state the fuel efficiency class, the external rolling noise class and measured value and, where applicable, the wet grip class, of C1, C2 and C3 tyres in technical promotional material, including on their websites, as set out in Annex I, in the order specified in Annex III. 4. Suppliers shall make technical documentation available to the authorities of Member States on request, for a period ending five years after the last tyre of a given tyre type has been made available on the market. The technical documentation shall be sufficiently detailed as to allow the authorities to verify the accuracy of information provided on the label with regard to fuel efficiency, wet grip and external rolling noise. before the sale of the tyre, the label referred to in Article 4(1)(b) is shown to the end-user and is clearly displayed in the immediate proximity of the tyre at the point of sale. 2. Where tyres offered for sale are not visible to the end-user, distributors shall provide end-users with information on the fuel efficiency class, wet grip class and external rolling noise class and measured value of those tyres. 3. For C1, C2 and C3 tyres, distributors shall state the fuel efficiency class, the external rolling noise measured value and, where applicable, the wet grip class, as set out in Annex I, on or with the bills delivered to end-users when they purchase tyres. Where end users are offered a choice at the point of sale between different tyres to be fitted on a new vehicle which they are intending to acquire, vehicle suppliers and distributors shall, before the sale, provide them with information, for each of the tyres offered, on the fuel efficiency class, the external rolling noise class and measured value, and, where applicable, the wet grip class of C1, C2 and C3 tyres, as set out in Annex I and in the order specified in Annex III. That information shall be included at least in the technical promotional material. The information to be provided under Articles 4, 5 and 6 on the fuel efficiency class, the external rolling noise class and measured value, and the wet grip class of tyres shall be obtained by applying the harmonised testing methods referred to in Annex I. Member States shall assess the conformity of the declared fuel efficiency and wet grip classes, within the meaning of Annex I, Parts A and B, and the declared external rolling noise class and measured value within the meaning of Annex I, Part C, in accordance with the procedure set out in Annex IV. 1. Where the requirements of this Regulation are complied with, Member States shall neither prohibit nor restrict the making available on the market of the tyres referred to in Article 2 on grounds of product information. 2. Unless they have evidence to the contrary, Member States shall consider that labels and product information comply with this Regulation. They may require suppliers to provide technical documentation, in accordance with Article 4(4), in order to assess the accuracy of the declared values and classes. Member States shall not provide incentives with regard to tyres below class C with respect to either fuel efficiency or wet grip within the meaning of Annex I, Parts A and B respectively. Taxation and fiscal measures do not constitute incentives for the purpose of this Regulation. adaptation of Annexes I to IV to technical progress. In accordance with Regulation (EC) No 765/2008 Member States shall ensure that the authorities responsible for market surveillance verify compliance with Articles 4, 5 and 6 of this Regulation. 2. Where reference is made to this paragraph, Articles 5a(1) to (4) and Article 7 of Decision 1999/468/EC shall apply, having regard to the provisions of Article 8 thereof. the information on tyre parameters provided by vehicle suppliers and distributors to end-users. 2. The Commission shall present the result of this assessment to the European Parliament and the Council no later than 1 March 2016, and, if appropriate, submit proposals to the European Parliament and to the Council. Articles 4 and 5 shall not apply to tyres produced before 1 July 2012. This Regulation shall apply from 1 November 2012. (1) OJ C 228, 22.9.2009, p. 81. (2) Opinion of the European Parliament of 22 April 2009 (not yet published in the Official Journal), Council Common Position of 20 November 2009 (not yet published in the Official Journal) and Position of the European Parliament of 24 November 2009(not yet published in the Official Journal). (3) OJ L 200, 31.7.2009, p. 1. (4) OJ L 189, 18.7.2002, p. 12. (5) OJ L 297, 13.10.1992, p. 16. The fuel efficiency class must be determined on the basis of the rolling resistance coefficient (RRC) according to the ‘A’ to ‘G’ scale specified below and measured in accordance with UNECE Regulation No 117 and its subsequent amendments. If a tyre type is approved for more than one tyre class (e.g. 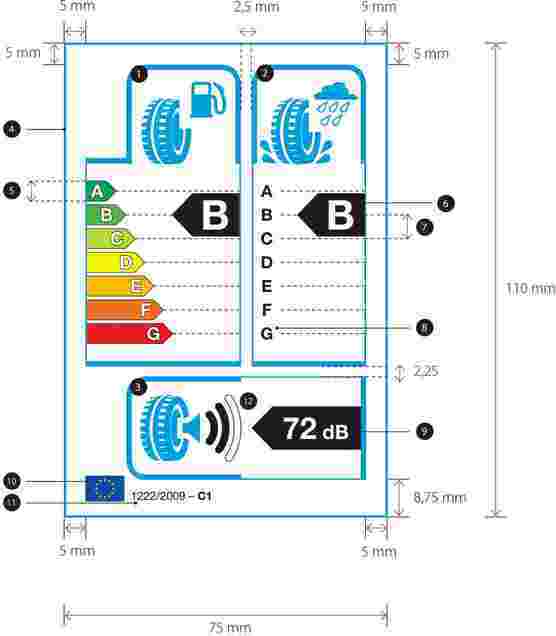 C1 and C2), the grading scale used to determine the fuel efficiency class of this tyre type should be that which is applicable to the highest tyre class (e.g. C2, not C1). The wet grip class of C1 tyres must be determined on the basis of the wet grip index (G) according to the ‘A’ to ‘G’ scale specified below and measured in accordance with UNECE Regulation No 117 and its subsequent amendments. The external rolling noise measured value (N) must be declared in decibels and calculated in accordance with UNECE Regulation No 117 and its subsequent amendments. The external rolling noise class must be determined on the basis of the limit values (LV) set out in Part C of Annex II of Regulation (EC) No 661/2009 as follows. 1.3. The label must be at least 75 mm wide and 110 mm high. Where the label is printed in a larger format, its content must nevertheless remain proportionate to the specifications above. 1.5. The tyre class (C1 or C2) must be indicated on the label in the format prescribed in the illustration in point 1.2. 2.1. The sticker referred to in Articles 4(1) and 5(1) consists of two parts: (i) a label printed in the format described in point 1 of this Annex and (ii) a brand space printed in accordance with the specifications described in point 2.2 of this Annex. 2.2. Brand space: Suppliers must add their trade name or trade mark, the tyre line, tyre dimension, load index, speed rating and other technical specifications on the sticker along with the label, in any colour, format and design, provided that this does not detract from or disrupt the message on the label defined in point 1 of this Annex. The total surface of the sticker shall not exceed 250 cm2 and the total height of the sticker shall not exceed 220 mm. the external rolling noise class and measured value (dB). if different grading is available for a given tyre type depending on dimension or other parameters, the range between the least and best performing tyre is stated. where the labelled classes or values are derived from type approval test results obtained in accordance with Directive 2001/43/EC, Regulation (EC) No 661/2009, or UNECE Regulation No 117 and its subsequent amendments, Member States may make use of the tyre conformity of production data from these type approvals. Assessment of conformity of production data must take into account allowances as specified in section 8 of UNECE Regulation No 117 and its subsequent amendments.